Verses 4 through 20 in Psalms 73 contain the Psalmist complaint to God about the “proud” and how they seem to prosper in spite of their “wickedness”. In some ways the Psalmist has a valid complaint for our times as well. I need to tell on myself because there are times even now when the Psalmist has taken the words right out of my mouth, or is it the other way around. Having said that I need to tell you this Glory Seed is not about the “proud” instead it’s about me, and anyone who finds themselves borrowing verses 4 through 20 of Psalms 73. This Glory Seed is about verses 21 through 26 and the light they bring to our lives, they form a prayer of repentance. Allow me to begin my prayer, and if you feel the need please join me. “…my heart was bitter… Yet I still belong to you; you hold my right hand… God remains the strength of my heart; he is mine forever…” Those words are like a cold glass of water after sweating in the hot sun cutting grass. That’s the God I believe in, that’s the God who will one day deal justly with all the “powerful and wicked” and those who are “weak and oppressed” will have their day in the abundance of Jehovah-Jireh, the God who sees and provides. Lord, it’s me Gary (_________________ use your name if you need to) again, My health may fail, and my spirit may grow weak… But I desire you more than anything on earth…” AMEN! 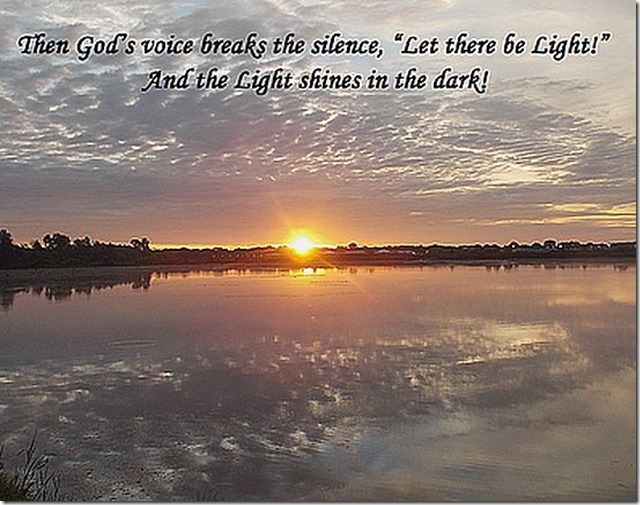 Then God’s voice breaks the silence, “Let there be Light!” And the Light shines in the dark!